GN Solids Control got another big order recently for providing all the solid control equipment and parts for 16 drilling rigs in Ukraine. This is another great example to demonstrate GN’s manufacturing capability and service ability to provide the good quality solid control products. 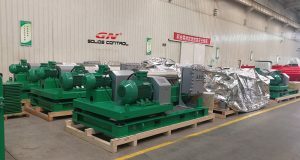 Since its establishment, GN has been always devoted to manufacturing high quality product and committed to providing the first grade service to its valued customers, its products covers every aspect of the solid control business in the oil and gas drilling, such as the shale shaker, desander, desilter, mud cleaner, decanter centrifuge, cutting dryer, centrifugal pump, screw pump, jet mud mixer, agitator, various kinds of tanks and systems. For this Ukraine project, GN provided more than 30 units of shale shakers, more than 30 units of decanter centrifuges, and more than 30 units of mud cleaner, and also provided 6 units of vacuum degasser. This Ukraine plan to fully upgraded its drilling systems, so they purchased a lot of new solid control equipment to meet their new requirement and large volume processing capacity. The decanter centrifuge is a very popular product among all of GN’s product line. 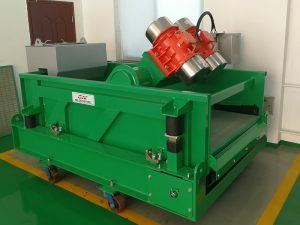 Now GN can manufacture the bowl size of the decanter centrifuge from 9 inch to 30 inch, all the bowl material is adopting the advanced 2205 stainless steel. The screw conveyor’s surface is covered with changeable tungsten carbide tiles, which is very tough and easy to maintain. The liquid and solid discharge port also upgraded to the new tungsten carbide, it will last longer and need little maintenance. The decanter centrifuge is also very compact and has small footprint, easily to remove and work in the remote area. The decanter centrifuge can separate the solid size up to 2 to 5 microns. When added some polymer, it can separate the solid size almost to zero. This can meet the most customer’s needs and requirements. GN will look forward to more business with you, please log on to www.gnsolidsamerica.com or you can send your inquiries to lucas@gnsolidscontrol.com.